There are times when we search on Google, “how to record screen on Android phones”. This situation can arise if we are a gamer and wish to upload the gameplay videos on video sharing sites such as Youtube. Or we want to provide technical support to someone by telling him/her how to go about doing stuff on their smartphone. In both the above cases, as well as many more, the ability to record the activity on one’s smartphone screen comes really handy. And since Android is an open mobile operating system, it has an API built in that allows apps to provide such a functionality to the user. No wonder there are numerous apps on the app store that boast of providing this functionality to all the Android users in the world. However, it’s a shame that Android itself still lacks the native ability to record screen activity, despite having exposed an API for the same. Only some Android custom ROMs have this feature built in, like MIUI. Even iOS now has this functionality built in, since the release of iOS 11. Anyways, there are plenty of apps to choose from, to get this functionality up and running on one’s Android smartphone. However, as mentioned earlier, there are numerous apps in the play store that provide this functionality. And for a new user, choosing the right app for the job can be a difficult task. 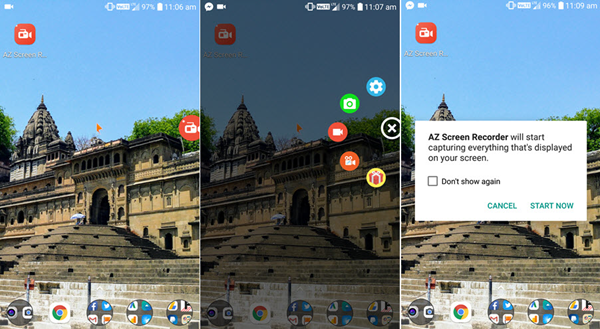 In this article we will share our personal favourite app, which we consider as the best Screen Recorder for Android with No Root required. If you are also interested in Android phone call recording, here is what you want. 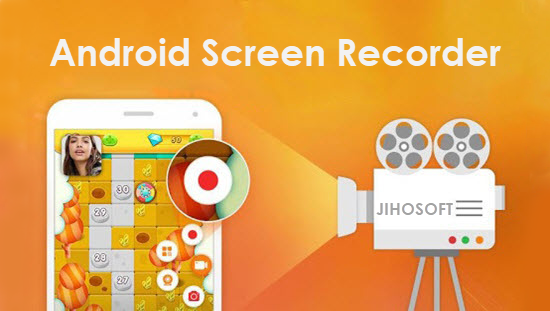 AZ Screen Recorder is one of the best Android screen recording app we have used personally. It is an ad free app, has no time limits on screen recording (unlike many other apps on the Play Store), no company watermark and works flawlessly without rooting your Android device. It has a very simple user interface. When you select the app after its installation, it shows up as a small popup icon attaching itself to the side of the screen. You can drag it to any corner of the screen. When you tap the icon, you get a circular menu with few icons for different options. There is a settings icon at the top, followed by 2 icons that capture the screen in photo and video format. And finally there are promotional offer icons. When you click the video icon, it confirms before recording screen. You can select the option to prevent this screen from popping up again. When you confirm, it starts recording. A panel is also attached in the notification bar. You can start the screen recording from here as well and record your Android screen with internal audio sound. You can stop the screen recording from the panel in the notification bar. A preview of the recorded video is shown. You can share or delete it from this preview popup itself. Closing the popup saves the video to the smartphone storage. Saved videos can be accessed from the Gallery app. Tip: If you find the video missing or you delete it by accident, you can try to recover the deleted videos from Samsung and other Android phones. The settings of this app has plenty of options. It allows pausing the recording in between, you can change resolution of recorded video as well as the frame rate of the video. There is also an option enable screen touch visual which shows where the users is touching on the smartphone screen. Moreover, it enables users to record Android screen with external audio but you need to root the device for that. When finished, just drag the bubble icon downto the bottom of the smartphone screen, where an X mark appears. This will close the app and the panel in the notification drawer also disappears. I prefer this app over other because of its simplicity and ease of use. The video quality of the recording is also top notch. The ability to select the video resolution, audio bitrate, video frame rate etc makes it really awesome to use. There is still a feature that I feel this app is missing and I feel developers of this app should add. It is the ability to add custom watermark or logo. It would be great of we could add our own logo or watermark to the recorded video to give it a more personal touch. This app has also received editor’s choice rating. But I find it a bit confusing when compared to AZ Screen Recorder. This is another highly rated screen recorder app. But I don’t prefer it due to ads.